This weekend will see me traveling to Connecticut and the Connecticut Renaissance Faire with The Rogues. I'm excited to see a new faire. I'll try to remember to take pictures. MDRF continues. Last weekend was a half work weekend for me. I sold moccasins on Saturday but on Sunday I spent the day wandering and collecting donations for the Ingrid Wendt Healing Fund auction. I also got to see some friends for the first time in aout a year though we didn't get to spend any time together unfortunately. I really miss my MD horror crew. It seems like everyone's life has gone in a new direction and we've all been scattered to the wind. I'm glad I'll get a chance to catch up with everyone October 20th at the faire though sad for the reason we'll all be able to do that. I love candles. The Inn is the perfect place to freshen the air with a scented candle with the exception of one thing ... soot. Okay, two things . . . soot and fire hazard. 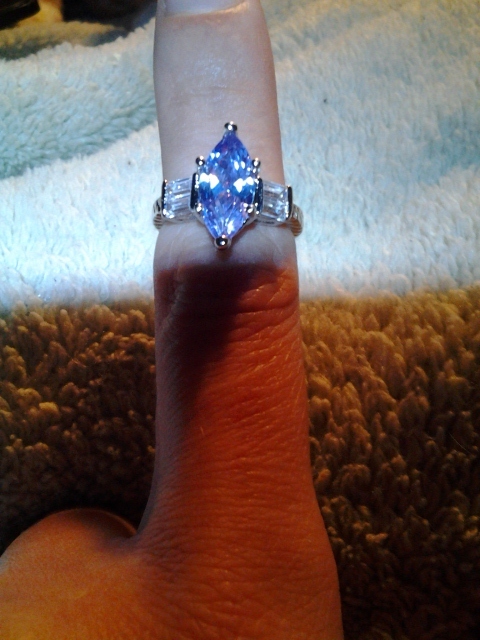 My $10 Diamond Candle ring. I recently heard about Diamond Candles - they are a soy candle with a ring worth up to $5,000 in it. My ring is a cheap knock off that they say is worth $10 but the candle itself is fabulous. I purchased the Vanilla Cream candle and it smells wonderful. It does a nice job of filling the Inn with its vanilla goodness. I'm looking forward to purchasing a Pumpkin Chai scent next.